Performance: 30fps@ CIF size (352x288 pixels). 30fps@ QCIF size (176x144 pixels). ochronous in 0.5 Mbps steps. Up to 30 frames per second at CIF resolution (352 x 288 pixels). Frame rate and size is adjustable to suit your application. A single snap shot button takes still photos at VGA resolution (640 x 480 pixels). Great for desktop publishing or web publishing. Utilize high speed hardware compression and software decompression to achieve the speediest video frame rates with low CPU usage. Convert analog video to an AVI file. One RCA and one S-Video input provides up to 2 analog video sources (including VCR, camcorder, and PC camera). Supports both NTSC and PAL systems. Powered by USB itself. No need to install batteries or run off the external power adapter. Power Save feature enables power conservation when not in use. USB connection provides true plug and play, and hot pluggable capability. No more headaches with internal peripheral cards. 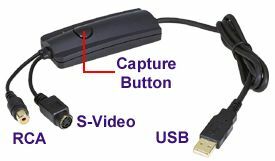 With very small dimensions, USB Video Adapter is a very portable device for desktop and notebook PC. A breeze to transfer from PC to PC.